I had said yesterday that I was a little disappointed in the Oscars Red Carpet, however the after party gowns more than made up for that. There were so many truly stunning gowns and I feel like one was more beautiful then the next. 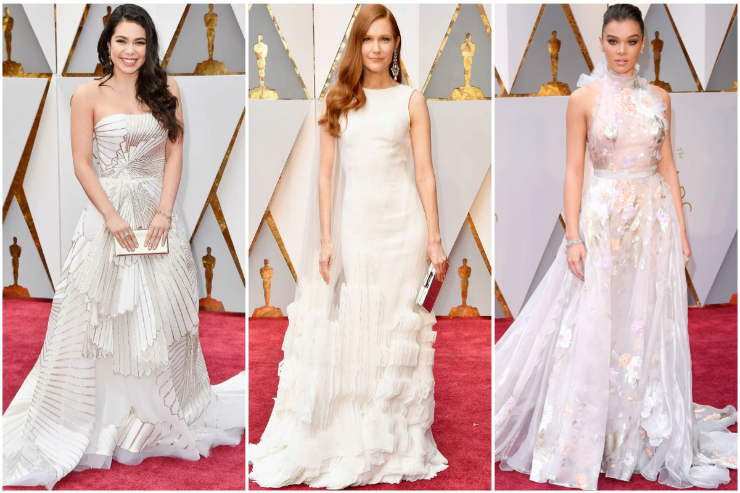 I love that we get double the fashion on Oscars night and always look forward to seeing what everyone is wearing at the Vanity Fair Oscar Party; thankfully last night's did not disappoint. Here I have put together all of my favorites for The Blush Blonde Oscars After Party Best Dressed List. So now that you've seen all my favorites who were yours? Let me know below, I'd love to hear! 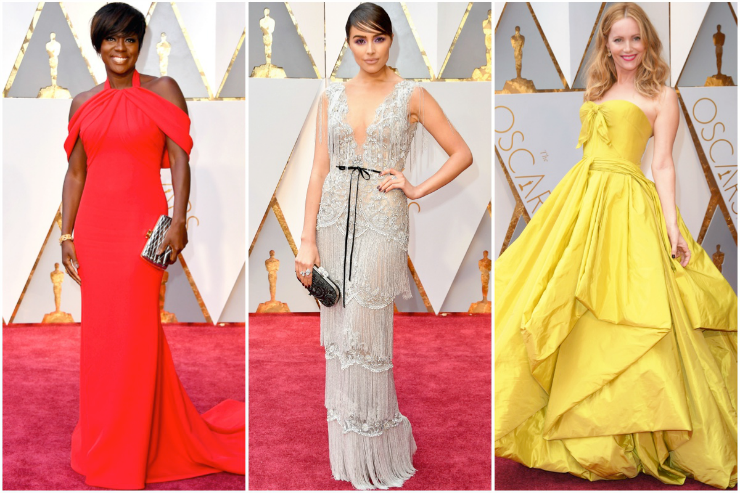 Don't get me wrong there were some gorgeous gowns at the Oscars last night, but overall I was a little disappointed. I feel like last year there were so many truly beautiful gowns that I struggled to narrow down my favorites and this year I definitely didn't have that problem. Below I have the dresses that I did love from last night in The Blush Blonde Oscars Best Dressed List and tomorrow I will have my favorite looks from all the after parties! So I had to take a brief hiatus from this space last week after my trip to Las Vegas. I knew when I got back that I would be tired, but I did not expect the jet lag to hit my as hard as it did! I had such an easy time transitioning from EST to PST, but the transition back was rough. Between being tired from a whirlwind weekend, traveling, major jet lag, and not feeling great I pretty much spent all last week sleeping, but things are finally starting to get back to normal! If you follow me on Instagram then you know I spent the last weekend in January celebrating my 25th birthday in Vegas. My last "big birthday" (twenty one) was kind of awful (I had a big surgery two weeks before, was in the middle of having major roommate issues, none of my friends were twenty one yet, and there was a snowstorm) so I decided I needed to do something big for twenty five. One of my closest friends from college recently moved to California with her husband so I asked her if she would want to meet in Las Vegas for a weekend to celebrate and go see Britney Spears. We had an amazing weekend and I would definitely say celebrating twenty five was my best yet! 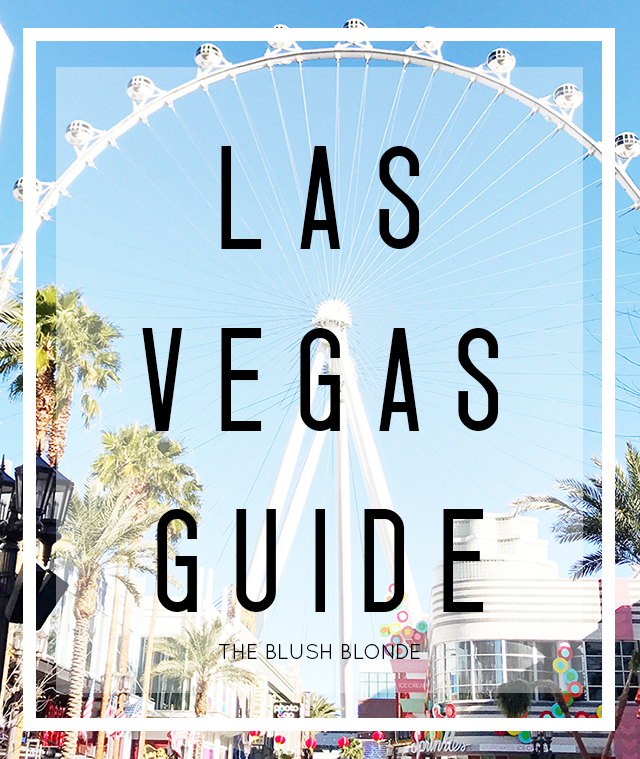 Below I am talking all about what we did and breaking down my guide to Las Vegas. Mirage Las Vegas || We stayed here in a basic room with two queen beds for three nights. The room was nice, clean, and quiet, and the beds were very comfy. The staff was also super nice and they gave us an upgraded room with a view of the Strip and their Volcano when I told them we were celebrating a birthday. On the first floor of the hotel there is eleven restaurants, three bars, a club, a Cirque du Soleil show (which we were able to catch a practice of! ), numerous theatres, a casino, shopping, an animal habitat, and a pool. We took advantage of almost everything they had to offer and really enjoyed ourselves. You have basically everything you could ever want and I would definitely recommend staying here. Other || While we were there we visited almost all the hotels on the Strip to see what they were about. Other places that we thought looked nice to stay were Caesars Palace, The Palazzo, The Venetian, Planet Hollywood, Bellagio, and The Cosmopolitan. LVB Burgers || This is located inside the Mirage and I grabbed dinner here the first night when I was staying alone (my friend arrived the next day). After two flights and a layover I was craving a burger and fries and this place really hit the spot. The burger was big and juicy and the fries were crispy. It also had a nice relaxed atmosphere and large TVs with different games on so I had something on to watch. Sushi Roku || This upscale Japanese and sushi restaurant is located in the shops at Caesars Palace. We both ordered sushi, which was so good and the portions were generous. All the food was super fresh and they filled their California roll with fresh crab instead of crab stick, which is always a favorite of mine. Lavo || Lavo is a well known club and I was surprised to find out that they actually also are an amazing Italian restaurant. It is located inside the Palazzo and has a fun, yet cozy vibe. Their menu offers many classic Italian dishes and some unique spins on old favorites. They also can make any pasta dish you order with gluten free, which was perfect for me. From the appetizer to dessert everything we ate there was delicious and I definitely want to go back next time I'm in Vegas! Pantry || This 24 hour breakfast spot was located inside the the Mirage just a few steps from the guest elevators and we ate here two mornings. It felt like a sweet little cafe and I got a Southern vibe from it. I love to get pancakes when I'm on vacation and the ones they made were so good and there was way too much for me to eat! If you stay at the Mirage don't bother looking for somewhere to have breakfast, go here you will not regret it. Grimaldi's || During lunch on the second day we were walking around the Palazzo and Venetian and grabbed lunch at this pizzeria in the Grand Canal Shops. I have had pizza in NYC before and they are definitely serving authentic New York pizza here. It's a perfect place to grab a quick and casual bite to eat while walking around and shopping. Fin || Fin is also located in the the Mirage. It serves high end Chinese food in a beautiful setting. I ordered the General Tso's Chicken (a favorite of mine) and it was delicious. However, we were not fans of the restaurant atmosphere, the staff was unfriendly, unhelpful, and our waiter did not speak much English (and looked at me like I was crazy when I said I had a tree nut allergy, which was not comforting). As good as the food was I don't think I would go back here because there are too many good restaurants in Las Vegas to have to deal with poor service. Sprinkles || Sprinkles is always a must visit when I'm in NYC so I had to go to the one in Vegas! If you like cupcakes, cookies, or ice cream you have to stop here. It's located in the LINQ Promenade and is as adorable as Sprinkles always is. This is especially a must stop if you are gluten free they're Gluten Free Red Velvet Cupcakes, and Gluten Free Chocolate Chip cookies are the best I've ever had. To be completely honest I found the amount of shopping in Vegas to be a little overwhelming and redundant. It felt like there were the same shops everywhere we went on the Strip and I know that we definitely missed some places, like the Fashion Show Mall, because we wanted to see more then the same stores that we could see at a mall at home. Places we walked around to shop were The Forum Shops at Caesars Palace, The Grand Canal Shoppes at The Venetian and Palazzo, and Miracle Mile Shops at Planet Hollywood. Siegfried & Roy's Secret Garden and Dolphin Habitat || When I found out that they had this at the Mirage I was so excited because I love getting to see animals. In the large Dolphin Habitat there are probably between ten and twelve dolphins that you can see both above and underwater. They're quite active and you can even view their feedings. In the Secret Garden they have white lions, white tigers, leopards, and black leopards. All of the big cats were gorgeous and we had so much fun watching them. The oldest white tiger was super active playing with his waterfall, jumping in and out of the pool, pawing around a giant ball, and more, which was so fun to see. Gondola Ride on the Grand Canal || I feel like this is such a touristy thing to do in Vegas so of course we just had to do it! You can ride down the canal in a gondola at the Venetian and the gondolier sings you Italian songs (he even sang me "Happy Birthday" in Italian) and tells you about the architecture around the canal. It was a nice ride, a fun way to see the hotel, and a great way to get a little rest! Eiffel Tower || So we didn't actually go up in the Eiffel Tower at the Paris, but we walked over to see it and went inside the hotel lobby. It felt very French (albeit tacky French) and was a cool place to visit. Fountains of Bellagio || The number one thing everyone said to do in Vegas was to see the fountains. Unfortunately when we walked over to see them they weren't going, but we got to see the hotel and where they go off and I had seen them on TV before so I wasn't too disappointed. High Roller Wheel || Located at the LINQ the High Roller is the World's Tallest Observation Wheel. This giant ferris wheel "takes 30 minutes to complete one full revolution and features 28 glass-enclosed cabins with broad views of Las Vegas and the Strip." We went up at night, which was awesome because we got to see the entire Strip all lit up from way up in the sky. Another cool feature is that you can get a cabin with an open bar and have drinks during the ride. I would definitely say that this is something you absolutely have to do while in Las Vegas. Flamingos || You can see actual flamingos at the Flamingo, which we had to stop in and see. They have a nice little wildlife habitat with a few different fish and birds. A great part of this is that you can get to it from the LINQ Promenade, so it's easy to just pop by, and it's completely free. Britney: Piece of Me || The big reason we went to Vegas was to see Britney Spears' residency show. I am a huge, huge, huge fan of hers and have been since I was five years old, but have never been able to see her perform in person. I was crazy excited to see this and it did not disappoint. It was a full hour and a half of dancing and singing and was just amazing. I was able to see her perform literally every song I wanted and her dancing was just incredible. I would go see it a million more times and want to plan another trip to Vegas to see it again. Frank Marino's Divas Las Vegas || We went to see this drag show on a whim and absolutely loved it. We got a great deal* on the tickets and decided to get ones for the front row, which was such a good decision. If you're looking for a laugh, a lot of fun, and a really great show you will love this. We got our tickets for this show at Tix4Tonight Half Price Show Tickets booth and like I said we got a really good deal on the tickets, especially upgrading to the front row. If you have your heart set on a show I recommend purchasing tickets through the show's venue in advance like we did for Britney Spears, but if you're open to seeing different shows going to Tix4Tonight is a must because it will save you a lot of money. We went to the booth in the morning, read the list of available shows, and spoke with the helpful sales associates before deciding on a show and purchasing our tickets. I had such a great time in Las Vegas and would love to go back again at some point. If you have any Vegas recommendations please leave them in the comments - I'd love to learn about them!